From March 7 to 9, Liberian and European Union specialists have gathered to proceed to the identification of needs in order to strengthen the country’s system to deal with threats emanating from Chemical, Biological, Radiological and Nuclear agents and materials. From March 7 to 9, Liberian and European Union specialists have gathered to proceed to the identification of needs in order to strengthen the country’s system to deal with threats emanating from Chemical, Biological, Radiological and Nuclear agents and materials. Two experts of the Joint Research Center, one of the scientific bodies of the European Union, participated in this workshop gathering all the Liberian stakeholders playing a role in the prevention, preparedness and crisis response of CBRN-related whether of a criminal, accidental or natural origin. This activity takes place within the framework of a global EU action referred to as the “EU initiative of the Center of Excellence for the CBRN-related risk mitigation.” This cooperation program brings together fifty-four countries worldwide clustered around eight centers of excellence. The objective is to support participating countries to develop national capacities and internal coordination as well as to strengthen regional and international cooperation which is crucially needed to tackle this transversal issue that does not stop at national borders. After or in parallel to the designation of a national focal point and the establishment of national CBRN team, this needs assessment workshop is the first step towards the development of a national action plan that should notably help better target national priorities through the capacity-building projects that the initiative funds in each region covered. The exercise is based on a methodology specifically developed by the EU covering legislative, regulatory, strategic, institutional, and operational aspects. This process enables to determine the measures to take to reduce CBRN-related risks in conformity with norms and best practices internationally recognized. Liberia is part of the Centre of Excellence of the African Atlantic Façade since August 2013 together with Morocco (where the regional secretariat is based), Mauritania, Senegal, Ivory Coast, Togo, Benin, Cameroon, and Gabon. The country participates in four projects respectively on the detection of infectious viruses, the management of epidemics, the mitigation of chemical industrial risk, and the management of biological and chemical waste. It also participated in the two closed projects on the management of sensitive CBRN-related information and the development of e-learning courses on CBRN risk mitigation. Incidents related to Chemical, Biological, Radiological, and Nuclear materials and agents have dramatic human, social and economic consequences. In some cases, their consequences may reach a point where they actually threaten to jeopardize development achievements. To a certain extent, these incidents can however be prevented and their consequences mitigated through preparedness and coordination. 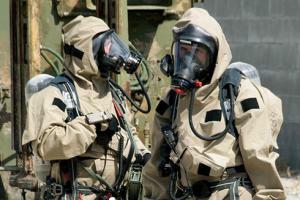 It is with this objective to strengthen CBRN governance worldwide that the EU set up the CoE Initiative. Launched in 2010, it pursues the objective to prevent, prepare and help respond to CBRN-related incidents which can be of a criminal, accidental or natural origin. It does so by promoting and supporting political and operational cooperation at internal, regional and international levels. Since these threats often have a transnational nature and require a high-level of expertise requiring the sharing of best practices and the pooling of resources, the action has indeed a regional approach. There are three levels of actions that it works on. At the institutional level, each participating state is asked and supported to nominate a national focal point and to establish a national team comprised of all relevant stakeholders. At the political level, they commit to proceed to the identification of their needs through a specifically developed methodology (Needs Assessment Questionnaire — NAQ) and, on this basis, to develop and adopt a national action plan (NAP). At the operational level, participating countries benefit from several regional capacity-building projects that they develop together. These projects cover a wide variety of fields including for instance safety and security, emergency planning, crisis response, export control, illicit trafficking, storage and disposal, and redeployment of scientists. To date, there are fifty-four countries belonging to eight centers of excellences for South East and Eastern Europe; African Atlantic Façade; North Africa and Sahel; Eastern and Central Africa; Middle East; Gulf Cooperation Council Countries; Central Asia; and South-East Asia. These centers are administered by a regional secretariat located in one of the concerned participating country. These secretariats benefit from administrative, logistical, as well as technical assistance. Financed by the EU with a budget of €185 million for the period 2007-2017, this endeavor is implemented through its Joint Research Centre and the United Nations Interregional Crime and Justice Research Institute.